Providing a wealth of guidelines and background information on postsurgical rehabilitation of the orthopedic patient in a convenient format, this portable reference is the therapist’s first choice for a quick overview of the rehabilitation plan following orthopedic surgery. Easy-to-follow phase-guideline boxes encapsulate crucial information for over 45 surgeries into phases of healing and rehabilitation covering goals, precautions, treatment strategies, and criteria for advancement — perfect for the busy clinical setting. Quickly find and review the information you need with convenient bulleted rehabilitation guideline tables. Succinct overviews of surgical procedures help you remember key details of surgical procedures. Brief overviews of rehabilitation plans let you quickly review the principles and strategies of rehabilitation that promote healing and recovery from orthopedic surgical procedures. Criteria for advancement help you determine when your patient is ready to advance to the next phase of rehabilitation. 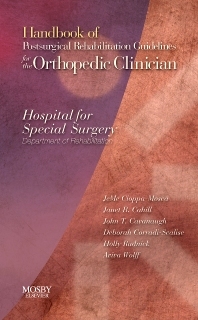 Editors and contributors from one of the world’s most prestigious orthopedic hospitals provide authoritative guidance on orthopedic rehabilitation.